For David Martin, cofounder of Nureva, the importance of hearing and being heard has been on his mind for a long time. These personal experiences sharpened his focus on a problem that affects everyone, no matter their hearing – bad conference call audio. David has sat through countless conference calls in his long career. He’s noticed that the same questions keep coming up. And with more people working remotely and companies increasingly embracing the value of collaboration, David knew the need for better audio conferencing would increase. To solve this, many companies have turned to complicated, multiunit installed audio conferencing solutions. But these can carry heavy costs associated with purchase, installation and maintenance. In addition to these issues, David couldn’t help but feel that these systems were increasingly out of step with the times. They were designed for static meetings, where people sat around a table consuming information. 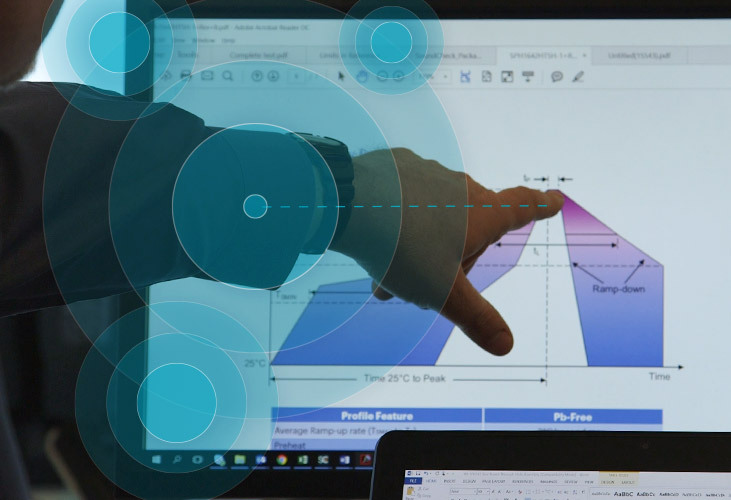 When people began to move around the room, using whiteboards, displays and products like the Nureva visual collaboration solutions to actively collaborate, traditional audio systems couldn’t keep up. For David, there’s nothing better than a tricky problem – especially one in need of a fresh perspective. Conference call audio fit the bill. “Conventional systems are just incremental improvements on technology available since the 1880s,” he says. This led David to ask a simple question. An early idea was to use people’s phones to increase audio pick up. To better locate the phones, the team used signals that sounded like noise. And then a lightbulb moment: what if they turned things around and used signal processing technology to hone in on the person speaking instead? The change was simple, but one that would eventually become the heart of a whole new way to do audio conferencing. It meant a room could be filled with thousands of virtual microphones (8,192, to be precise), so that no matter where a person moved or faced, a mic would always be nearby. Plus, the technology took away any need to switch between mics – they could be used simultaneously to get a better signal. 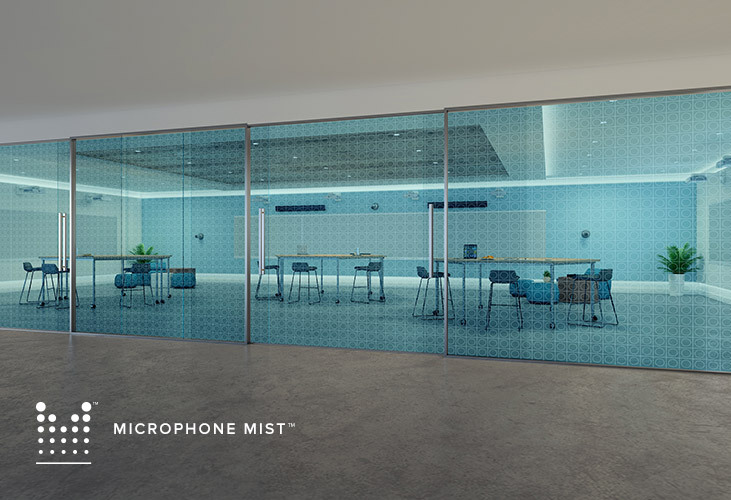 Eventually, the team’s creation would be known as Microphone Mist technology. But for now, it was just a better way to look at an old problem. 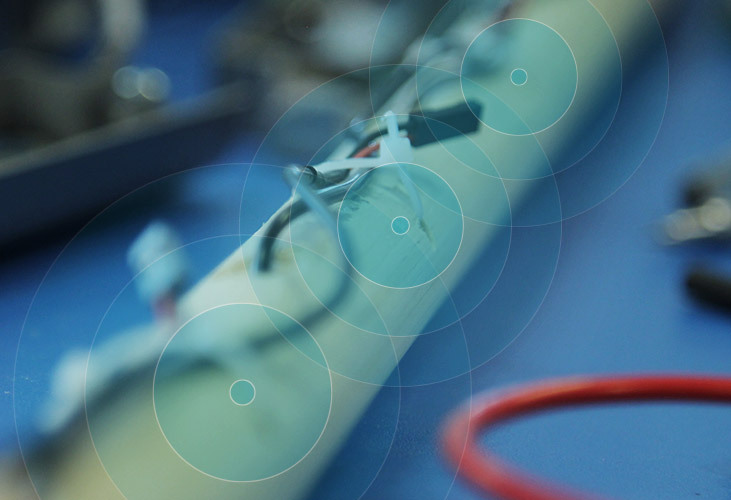 To quickly test whether their theories could be executed in practice, they employed MATLAB® software to simulate how the algorithms they were deploying changed the audio experience. (They would use the software again during the development process.) Now confident that their ideas would work, they invested the resources to create the first real prototype. 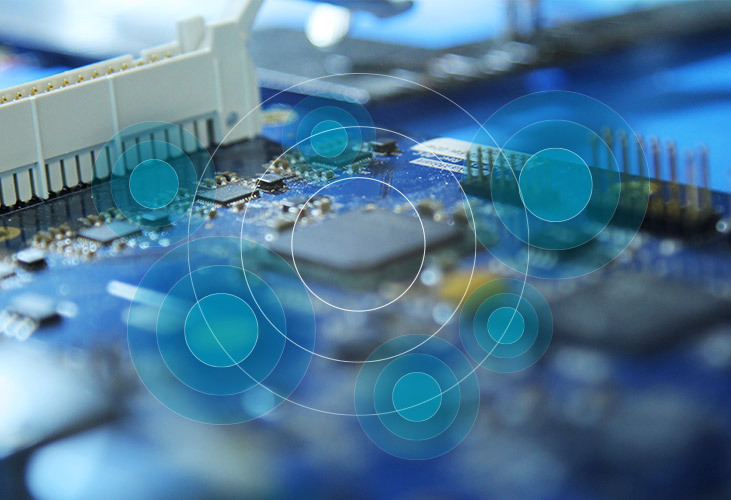 Current processors couldn’t locate sounds as fast and reliably as the team needed. This wasn’t surprising – conventional audio systems didn’t put these kinds of demands on processors. Undaunted, the team developed a custom processor with much, much more power (eventually enabling signal processing at 15,000 MIPS) to handle the inputs. Now, even simultaneous echo cancellation (which many people told them couldn’t be done) became possible. At this point, the product still required microphones to be installed in the ceiling, an expensive and invasive approach they were explicitly trying to avoid. Then they wondered: why install in the ceiling when you could hang it on the wall? The first iteration of the new concept was DIY at its best. “We took a broomstick and drilled a bunch of holes in it. We pulled the 12 microphones out of the ceiling and stuck them into the broomstick and put it up on the wall.” The team christened the prototype Audio on a Stick. And it worked. They were delighted. The initial fuzzy idea about doing audio differently was starting to look more and more like an actual product. As more people heard the sound coming from the newly named Nureva™ HDL300 audio conferencing system, they knew they were experiencing something special. It was time to show the world this game-changing innovation. The stage would be InfoComm 2016 in Las Vegas. The team had just three weeks to put together the firmware and hardware and test everything. But, there was one more problem. They set up the HDL300 at the show, and suddenly the unit that had worked so well in the office wouldn’t work properly. “It would perform perfectly for 30 minutes, and then it would go completely wonky,” remembers David. The team worked into the night to find the problem: a single line of incorrect code that affected one of the Ethernet ports. Luckily it was an easy fix, and the unit began working exactly as it was designed to. “There were people asking to buy it right off the show floor,” says David. And the team really knew they were onto something when other audio companies crowded the booth wanting to see this whole new approach to audio conferencing. The final triumph of their debut was winning Best New Audio Conferencing Product from rAVe Publications. 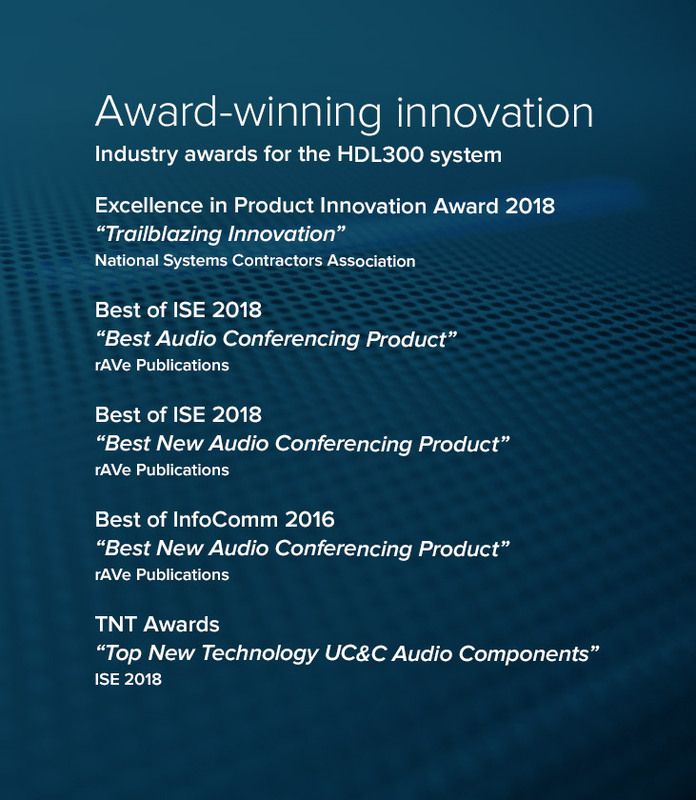 Two-and-a-half years (and many awards) later, the HDL300 is solving bad conference call audio – and enabling seamless collaboration – for customers all over the world. And the Nureva team hasn’t stopped innovating. 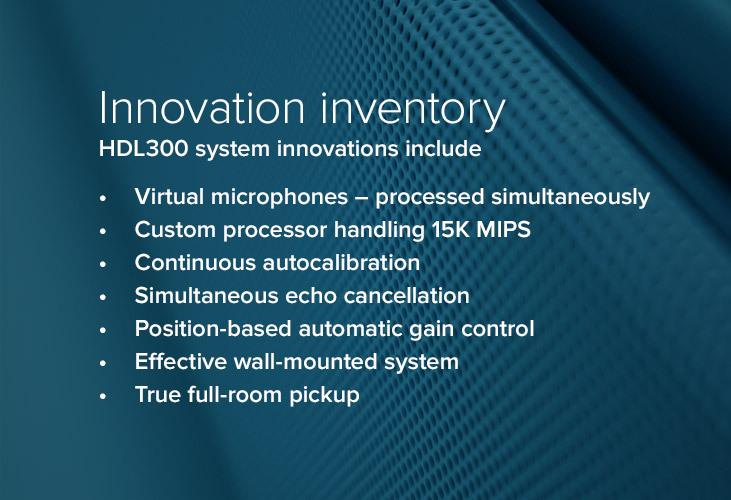 In addition to numerous advances in the performance of the HDL300, they recently released Dual HDL300, a system that handles the demands of large meeting spaces more effectively and at a much lower cost than traditional systems. And the Nureva audio manager lets users customize their audio experience and get performance-enhancing updates automatically. Interested in hearing what 8,192 microphones in a room sound like? When you book your personal demo, you can call in and experience the power of the HDL300 system in real time.